This me-made-month has been more frustrating than the previous ones for me. I've felt stymied and unsatisfied by my wardrobe. I had attributed this to a change in my style, and I think that is still partly true, but while I was updating my knitting project on Ravelry today, I realized that I'm overall much happier with my knitting projects. So then I started thinking about my 'knitting career' as it were and I remember that I've been knitting since 2000 and I've only been sewing since 2010. As the project time for sewing is generally shorter than for knitting, I can make way more learner projects in the same time period...that I now can part with! (Sorry, I've been watching the A & E Pride and Prejudice so my diction has been affected!) ;) This is just to say, that I don't feel bad about no longer having/wearing those early knitting projects, so I shouldn't feel bad about my early sewing projects. I can always reuse the fabric to make a quilt. Also, in my first years of knitting, I never put my creations on the web and participated in challenges! Well, such things didn't really exist back then. But, while I love the on-line interaction, it can lead one to pressure oneself and second-guess one's sartorial tastes and sewing decisions. :) Of course there's the inspiration and encouragement which far outweighs any negatives! 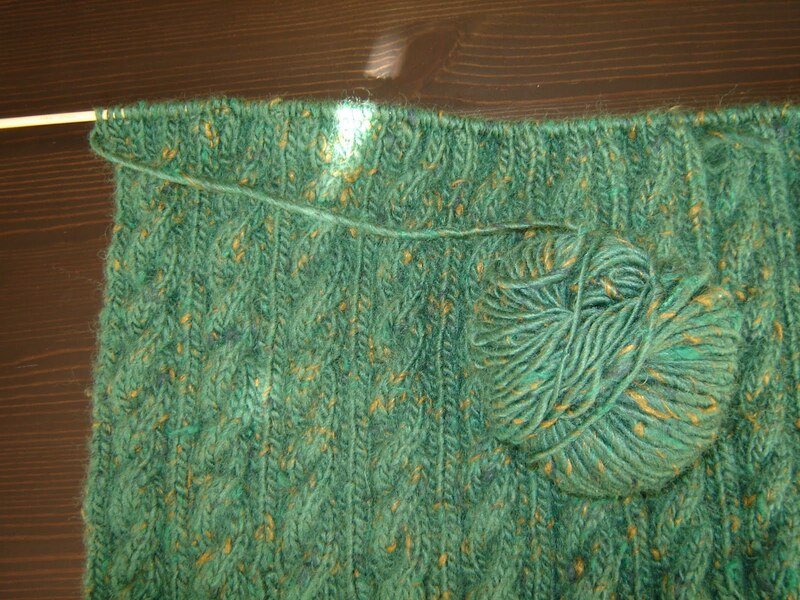 Moreover, when a knitting project doesn't work out - as sometimes occurs, either 1/2-way through a project or at the very end - I really don't hesitate to frog the entire thing and use the yarn for something else. And, somehow, I'm not too, too upset by the failure. Either because I enjoy the process so much that I still feel it was worthwhile, or perhaps, it's also knowing that I'll easily find another project to try with that same yarn. I feel like it's easier to just start over in knitting than in sewing...because there's no cutting out of pieces, just unraveling and casting on again! So I think one of the traps of my sewing has been that a) at the beginning, I had no strong knowledge/conviction about which fabrics to use; b) it goes too quickly ; and c) it can be done relatively cheaply. If it took months to finish a project I think I'd take more care when choosing a pattern/fabric. And I'd feel more justified in choosing a better quality/more expensive fabric! And I am happier, in general, with sewing projects in which I've invested more time and money. However, I think it's going to take much longer to have a similar skill level in sewing as I do in knitting w/ regard to fitting, simply because yarn is so much more forgiving! Knits readily conform to your body, whereas you have to compel wovens to do so by cutting them out and sewing them together cleverly. For those of you that started out in another area first - crochet, knitting, weaving, beading, etc. - how do you feel about it in relation to your sewing? Can you relate to what I'm saying? I've been knitting longer, and I feel surprisingly zen when I have to frog projects. 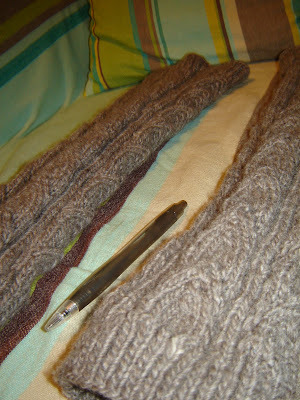 I think it's because mistakes in knitting don't have the same permanence. I think my skills in knitting progressed much quicker than they have in sewing-- I struggle with fit and construction techniques when I sew that don't even exist in knitting, where almost everything I make fits perfectly (or I frog it and start over!). Old sewing pieces can always be refashioned or made into quilts or something, but it seems like more work somehow, even though I don't think it really is. I'm still getting my head around it. What an interesting post, you make a really great point here, Donna! I´ve been sewing for seven years, and thinking about it, there´s three things I´ve learned that really have increased my sewing skills. 1) Making sure that fabric and pattern work well together (although I still struggle with that sometimes) and 2) Being accurate in the cutting and tracing process. 3) Taking time with the fitting throughout the sewing process (a lot of pinning and basting going on at the casa delfinelise). That´s about it. Being careful following those three rules, I felt a shift in my sewing. All of a sudden things turned out the way I wanted them to be. I don't knit or crochet- altho you have me longing to frog something now- and I wonder if I don't stretch myself or try harder things because i don't want to waste the fabric. I want to be environmentally conscious and not waste fabric.....but it has me a little land-locked. I started knitting in 2007 - and sewing seriously less than a year ago - and my experience seems similar: my first projects requiring fitting (not hats and scarves) were failures: I didn't take time to check gauge properly or to admit that I'm not a size 42, etc. So I really think it's part of the learning process: I've chucked away all my jumpers from the first two years of my knitting. But I think it's also because back then I didn't know as much about yarns, patterns, fit than I do now. And I suppose the same will come with sewing, I will learn about fabrics, techniques and what kind of patterns will suit me best. The hardest part for me now is to learn to be patient and confident in the fact that one day I'll be an advanced seamstress - but not just now after only a few months of sewing. I don't regret any of this period, some failed projects happened but I learned so much since last autumn!! Another problem for me - and one that might take more time to solve - is finding a (my) style: your reflexions ring a bell in my mind! That post certainly rings a bell with me, too. I have been knitting and sewing as long as I can remember (I also started with clothes for my dolls). So fortunately in those regions I have had my learning curve when perfection really didn't matter for me. When I started to care, I had the confidence in myself and practise to work on a different level. Also embracing the seam ripper and frogging helped a lot. But now the learning curve is something that annoys me when trying something new. I just don't like the thought of having to fight through a lot of things to produce the one thing I envision... I try not to let it hold me back though and treat it as invaluable learning.